There is nothing typical about the “typical’ Baby Boomer investor. There are 74.9 million Baby Boomers ages 51 to 69. A new Spectrem Group demographic study, “Baby Boomer Investment Personas”, finds five primary character traits that run the gamut from independent to advisor dependent. In part three of our series, we consider the Big Middle. You collect data on a large number of people, analyze that data, and some people just end up in the middle. That’s the case with the Big Middle, the title given in the new Spectrem study “Baby Boomer Investment Personas” to the Baby Boomers who find themselves as the median person among affluent Baby Boomers in terms of age, wealth, risk tolerance and knowledge of investments. The focus of the Baby Boomer Personas report was on affluent investors with a net worth of at least $1 million, not including primary residence. For instance, an investor in the Big Middle is probably male. Seventy-two percent of them are. They have an average net worth of $4.6 million, and have only a moderate taste for risk in investing. Less than 50 percent of the Big Middle investor is willing to take a big risk with investment funds on the possibility of receiving a big gain. The average Baby Boomer considers himself knowledgeable, perhaps even very knowledgeable, about investments. Perhaps that is why 89 percent of the Big Middle investor lists “smart investing’’ as the top reason they got to where they are from a wealth standpoint. However, 69 percent of the Big Middle say taking a risk played a role in their wealth level, and that is a high percentage for an average. 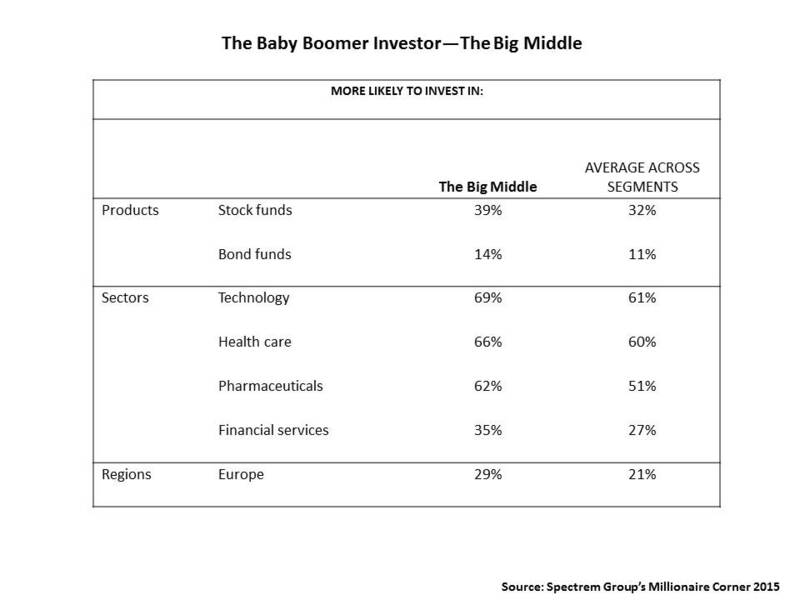 The Big Middle Investor is more likely to invest in stock funds (39 percent to 32 percent of all Baby Boomers), and he will also have a heavy dose of technology stocks (69 percent to 61 percent among all Boomers). Pharmaceuticals are another interest for the Big Middle, 62 percent to 51 percent among all Boomers. Almost all (92 percent) of the Big Middle investors have a financial advisor but 83 percent say their advisor is NOT looking out for their best interests. Still, their main reason for changing advisors has to do with communication, as 65 percent said not returning phone calls in a timely fashion would be a reason to change advisors.